I was standing on top of the world. Or at least that’s what it felt like as I gazed down towards the east at the low hanging clouds, dotting the river valley, bleeding into the horizon. I was surrounded by a high altitude forest, the trees spiny and small as they struggled to grow in the harsh conditions that can only be found high up in the mountains. Beyond the forest were beautiful yet rugged snow capped peaks, that mimicked an endless sea of crashing, white cap waves. 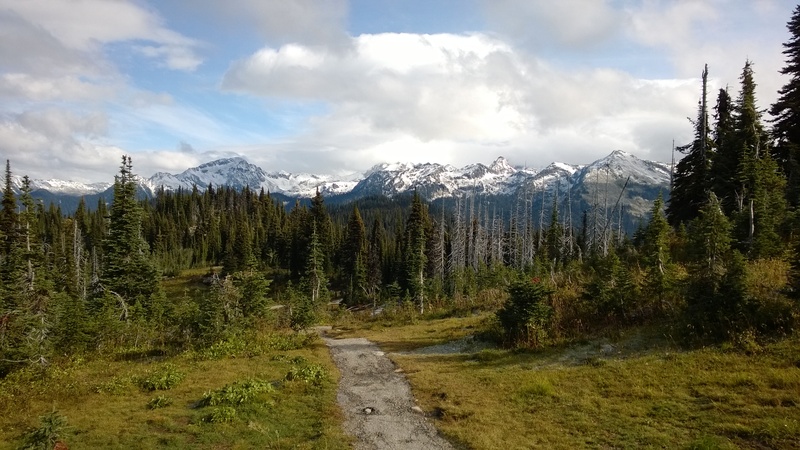 This beautiful and wild terrain was were I was to begin a wonderful trek with my mom, atop Mount Revelstoke in British Columbia, Canada. Located in the middle of the Columbia Mountain range, which is made up of the Selkirks, Monashee’s and Purcells, lies the little mountain community of Revelstoke. 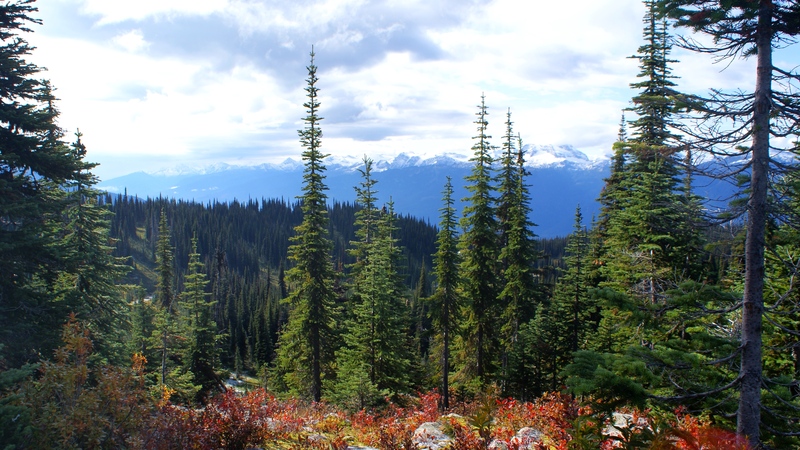 Smack in the center of the wilderness, Revelstoke is chalk full of adventure with lots of opportunity for hiking, mountain biking, river rafting, kayaking, and basically anything else you can think of doing in the middle of the Canadian back country. 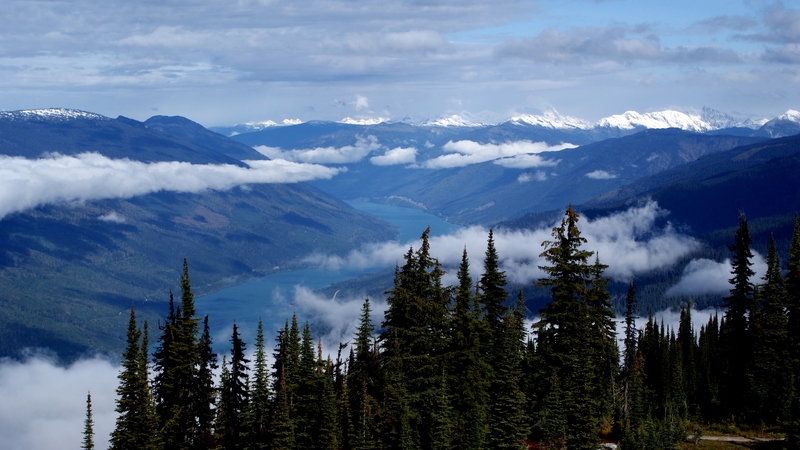 The town of Revelstoke itself is located at the edge of Mount Revelstoke National Park and is a suburb destination for hikes with incredible views of both the Columbia Mountains and the Columbia River set deep in a mountain valley. My parents recently moved to this wonderful mountain town so of course I went to visit! On my first trek out west, my mom and I took on a grueling but rewarding hike to beautiful Miller Lake and stunning Eva Lake at the top of Mount Revelstoke. We started out the day by driving the beautiful 26 km Meadows in the Skies Parkway from the base of the mountain to the Balsam Lake parking lot near the top. This is as high up cars are allowed (be prepared to pay the park fee when you enter the area). From this parking lot we had the choice to either hike the 1 km to the top via trail (not much for views but we’d be in the forest) or take the paved road (great for views as you ascend, but not as nature-intimate). There’s also the option to take a free ride on the Summit Shuttle Bus to the top from the Balsam Lake parking lot. We opted to walk the road as I counldn’t get enough of the mountain views. Once at the top, my mom mentioned a fire lookout tower that was a short walk away, which had amazing views of the valley. Not one to miss great views, we were up on the deck of the lookout tower in no time. Since it was a fairly clear day, the scene before our eyes was phenomenal. It was here that I felt that I had made it to the top of the world, surrounded by mountains, and would have been happy to leave right then and there after seeing the Columbia River stretching out to the east with snow capped peaks lining the valley, fading into the horizon. We made our way back down to the trail head and consulted a wonderful, large map that illustrated the various hikes from this starting point. We noticed that the trail to both Miller and Eva Lake was the same until less than 1 km from each, at which point the trail divides and you choose which lake you want to hike to. 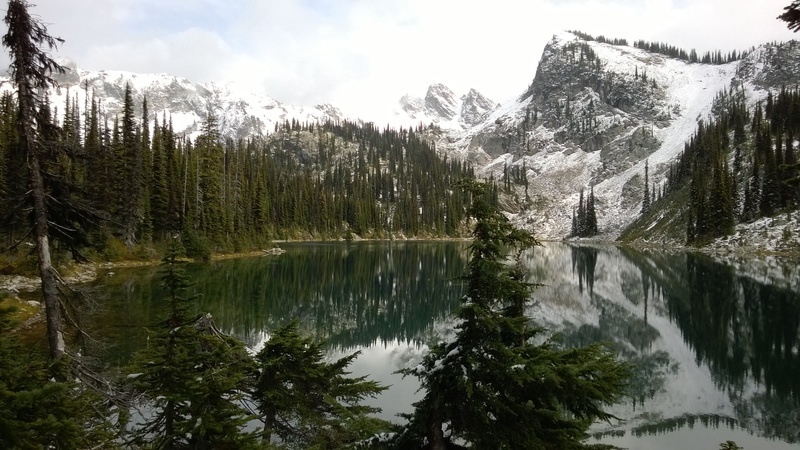 The initial plan was to hike to Miller Lake only, but as with any travel plans, our itinerary changed and we managed to see both (definitely worth it!). As we began the hike, we passed through forest with picturesque meadows on fairly flat terrain, with small ups and downs. Every now and then there would be a break in the trees and we’d be treated with yet another beautiful view of the valley and mountain range. Soon we left the meadows behind and encountered a more rough and rugged terrain. We found ourselves walking along a more steep and jagged landscape as we hiked along the base of the mountains. There were a few rock slides that the trail cut across and the hike got tricky, as we maneuvered around giant boulders and took in the view of steep intimidating cliffs above our heads. We encountered a few small mountain streams as they flowed down from high altitude lakes through the forest. As the map had promised, we eventually reached a fork in the trail with a sign pointing us to the closer Miller Lake to the right, and the slightly further Eva Lake to the left. We chose to head to Miller Lake first and enjoyed a lunch surrounded by high mountain walls and a beautiful crystal clear lake. 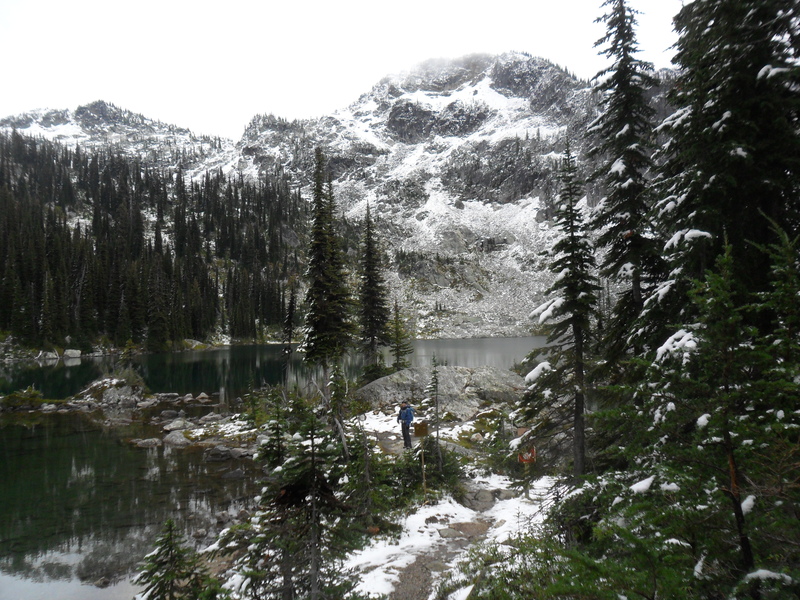 Since it was late September, we’d encountered a light dusting of snow on the ground as soon as we started hiking. Once at Miller Lake, it started to lightly snow on us as we ate our lunches, which made the experience all the more magical. I simply love first snow falls and how it decorates the trees and forest floor for the first time of the season. After refueling and using the outhouse (yes, there is a toilet! ), we started the trek back. Arriving at the fork in the trail once more, our curiosity and adventurous spirits took over. After a brief discussion, we followed the sign to Eva Lake rather than the one heading home. We thought we’d come all this way, why not check out both lakes? My mom and I had never actually intended to hike to both lakes but after seeing the beauty of Miller Lake, we couldn’t help ourselves and decided to check out Eva Lake as well. (My mom had been told by a local resident that Miller Lake was much more beautiful than Eva and that we shouldn’t bother with the latter. Just goes to show that sometimes it pays to go and explore yourself!). As we arrived at the stunning Eva lake, the snow fall had picked up, blocking our initial view of the back side of this high altitude lake. There was a small cabin to the left and a large mountain top to the right, at the end of the lake. The entire backside of the lake was lined with small pine trees, their growth being stunted by the elevation. There was a trail that went around the lake so of course we followed it. And we were rewarded once again for our hard work. Hidden behind the wall of pine trees and the curtain of falling snow was the most incredible view of the mountain next to us and the valley below. The snow even let up so that we could see mother nature in all her glory. After spending much too long admiring the views around Lake Eva, we finally started the long trek back. Although we were getting worn-out physically, we never tired of taking in the incredible scenery we were fortunate enough to be a part of. We truly were trekking in the wilderness of the mountains of British Columbia, getting caught is snow flurries and constantly calling out to warn the mountains lions and bears we were there, so as not to startle them (should they be close by). If there was wildlife about, other than the squirrels playing in the tree tops and birds soaring over our heads, we never knew. This special day with my mom turned out to be full of wonderful surprises and amazing discoveries, one of my favorite things about travel and adventure. A wonderfully written article about a very special day with my daughter! Fantastic pictures and a great description of a mountain adventure.